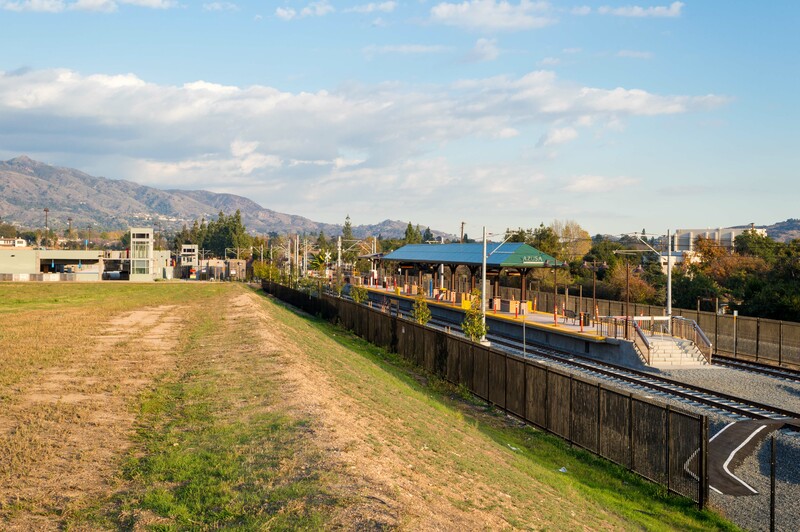 The Gold Line station adjacent to Azusa Pacific University, Citrus College and the Rosedale development. Citrus Avenue will run under the tracks, connecting East Promenade to Foothill Boulevard. Photo by Steve Hymon/Metro. Metro on Wednesday said it will open all six new Gold Line Stations on March 5 while helping with some mitigations to help customers reach the APU/Citrus College Station in Azusa. The city of Azusa, Azusa Pacific University and the Rosedale residential development recently asked Metro to delay the opening of the station by four months. The issue: an extension of Citrus Avenue from Foothill Boulevard to the station and its parking garage had not yet been completed by Rosedale, leading to concerns about too much car traffic instead using streets through Rosedale to get to the station. The San Gabriel Valley Tribune wrote about the issue earlier this week. In a response to the request, Metro Board Chair Mark Ridley-Thomas said that Metro and the Foothill Gold Line Construction Authority — the agency that built the project — will hire a traffic engineering firm to determine if there are other enhancements that can be made until the Citrus Avenue extension is finished. Ridley-Thomas also offered to use Metro safety ambassadors to help assist motorists and pedestrians trying to reach the new station. The Construction Authority will also run a bus shuttle connecting the college and university with the APU/Citrus College Station during school hours as another key mitigation. How We Roll, Jan. 14: what would Che Guevara do about L.A. traffic? This is the right decision to make and preserves Metro’s credibility coming into a possible sales tax increase measure. I also like how MRT notes the timeline of completion – where the parties could have made their objections known earlier, especially when ground hadn’t yet been broken on the roadway. I am glad Metro is able to put its foot down and squash that delay request. It would have been seriously damaging to delay that college station for a few months. It’s not like it took only six months to build the extention as was the case a hundred years ago when the P.E. was building lines. I hope Metro is monitoring the situation before March 5th. Presently the station is fenced off by Rosedale and/or City of Azusa. Will they move it to allow access? I live in Rosedale and find it ridiculous that Rosedale Land Partners, City of azusa amd Glendora couldn’t figure this out and get it done on time, unacceptable!